If you haven’t read this or seen the movie I recommend both. I enjoy the end of the book better only because SPOILERS, the book’s ending is it’s biggest difference from the movie. Fight Club is a 1996 novel by Chuck Palahniuk. Fight Club is a great book for anyone who wants to see a hateful look at the world. It displays all the sickening feeling that the underprivileged or lower class citizens might feel towards the upper class. 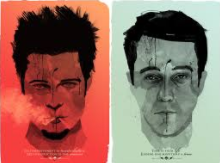 I cannot say that I agree with most of them but there was a point were adolescent me would have been right on board with the ideas, not so much the actions, of the books real star, Tyler Durden. This book is a twisted look at our society and how it’s evolved. It dregs into the philosophies of anarchy vs order. Fight Club does lay this on pretty heavily with imagery and if seeing it so thick that it’s on the furniture isn’t for you than the ideas of this book might push too hard for your enjoyment? The book ends with our main character in a mental asylum, thinking he in heaven? and knowing that project mayhem is being carried on without him. He has orderlies updating him as things progress. Pretty cool, better than buildings blowing up in my opinion. But buildings blowing up is better in a movie sense. It’s kinda cool that he ends with scars on his face like the Joker in “The Dark Knight”. I don’t just read, I write too! Check out some of my work here. I didn’t read the ending spoiler. But your review is compelling me to read the book off my shelf. I liked the book better than the movie. I’m glad your dusting yours off. Have you read it before? No. I haven’t. Been keeping off coz of movie. I liked both equally, but I am usually ok with changing elements of a story to better utilize film in an adaptation. And the ending of the movie was quite epic! I’ve seen Fight Club, but not read it, and I read the book end spoiler hehe, oh well. I have read Choke by the same author, which was pretty phenomenal in addition to his short story collection Haunted. I need to read Choke. Loved the movie. There was a Choke movie wasn’t there? I need to see that.